In late May, the oil price reached the key resistance level of 72.65, after which it declined significantly in the three trading weeks. In the middle of the month, the instrument broke the lower border of the long-term upward range and reached the level of 63.35, rebounded from it due to the strong fundamental background and the growth in demand, and returned to the maximum of late May in several trading days. "Black gold" is growing due to Iran oil exports sanctions and the OPEC+ agreement implementation. In addition, despite the increase in oil production in the US, the number of active rigs has remained unchanged since the end of May. Today Baker Hughes US Oil Rig Count and a number of key American releases that can affect the price will be published. The probability of testing new local highs is high. In the short term, the growth to the upper border of the current channel 75.00 is expected, and then the instrument will reverse into a broad consolidation. 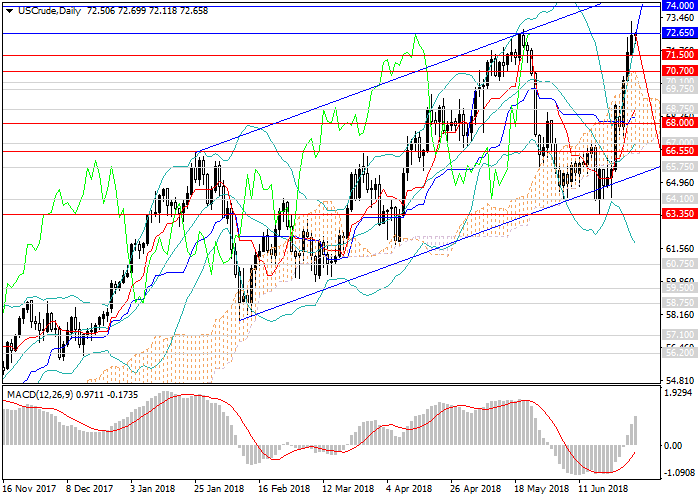 However, in the long term, taking into account the risks and stabilization of the oil market, the price may rise to 80.00, 83.00 dollars per barrel. Technical indicators confirm the growth forecast. On the daily chart and higher, the MACD volume of long positions is increasing, Bollinger bands are directed upwards. Resistance levels: 72.65, 74.00, 75.00, 76.00, 76.25, 77.30. Support levels: 71.50, 70.70, 70.10, 68.00, 66.55, 65.75, 64.10, 63.35. It is relevant to increase the volumes of long positions from the current level and open pending short positions from the levels of 68.75, 68.00 with the targets at 75.00, 77.30 and stop loss 64.70.